I recently just purchased a Casio CDP-120 88 Weighted-Key Digital Piano (Standard) . And I love it! As a child, I never really appreciated the piano lessons my mother painstakingly drove me to and paid for. And after high school I stopped all together. Even though I never really played again apparently I’m a piano snob. I found that I turned my nose up against keyboards. Having grown up with a piano I like the solid feel of the keys beneath my fingers, not the airy feel that keyboard keys tend to give. One weekend I was at my parents house passing time, no one was home, and the internet was on the fritz…again. So I decided to take out my dusty music books from the piano bench and play a diddle or two on the piano. Before I knew it I was happily still able to sight read some old songs and played away on the baby grand ivories. Thoughts of having a real piano where I lived were not to become reality any time soon. Boston apartments don’t really allow for heavy, large musical instruments, especially not the likes of a baby grand. Just this past weekend, after guests had departed from a large party my parents threw at their house, my cousin and I played some tunes on the piano again. This time the bug caught bad. I was happy when I played. I wanted to have a piano, but I couldn’t. Ugh. The Catch-22. Someone then told me that there were keyboards that had 88 weighted keys that felt like a piano. I said, “No waaaay!” So on to the internet I went and lo and behold! There they were, full size keyboards with weighted keys! Brands from Casio, Kurzweil, Akai, Yamaha, etc. with price ranges from $400 to $1200 and more. Obviously I am on a strict budget so I decided to check out the low end Casio CDP 100 Digital Piano. All the reviews that I did read from other musicians and pianists said that it was a really good piano keyboard for the price. It felt like a real baby grand piano and the sound was pretty realistic. Then I looked up a YouTube demo of the CDP-100 and was hooked. I was determined to buy it the next day. Unfortunately, that day was Sunday, which meant I had to wait until noon to get my new toy from Guitar Center. While I waited I passed time looking through Craiglist to see what was available. Someone was selling a used CDP-100 for $50 off retail. I emailed them with a lower price and was told I could come see it at 5pm. Ugh! That pushed the time back for my new toy very close to closing time for Guitar Center if I didn’t like the used one. Finally noon came and I called Guitar Center. The Boston store had no stock, but they said the Natick store did. So I called up there and was told there were no 100s, but the Casio CDP-120s were in. Same price as the 100. The upgraded Casio CDP-120 is now USB plug and play, has 48 polyphony (the 100 has 32), Transpose functions, Touch function, Tune function, Keyboard Channel, Local Control function and the tone is improved. Everything else is more or less the same: 5 demo samples of each of the pianos (Grand Piano 1, Grand Piano 2, Electronic Piano, Harpischord, and Strings), speakers, damper pedal, music stand, Reverb function, and Chorus function. There is no metronome function for the 120 or the 100. Five o’clock came…and went, and I never heard back from the CL poster. Which was fine by me, I wanted the newer piano keyboard anyway. Off to Natick we went. There was a floor sample of the Casio CDP-120 and I pinged around on it. It felt very nice and sounded very nice. The speakers were good too. For some reason I thought I had to get external speakers for it [lol don’t ask me why! :)] So I was happy to find out that I didn’t need to. 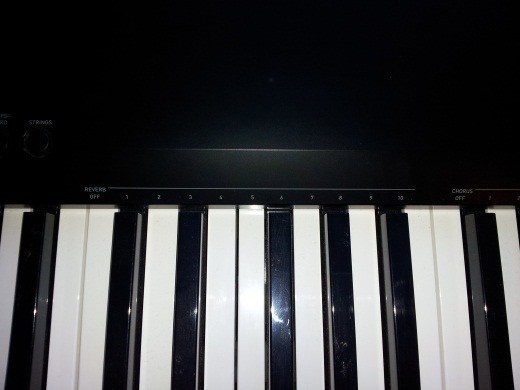 I purchased the digital keyboard and a couple of books: ‘Alfred’s Self-Teaching Adult Piano Course’ and ‘Alfred’s Essentials of Music Theory A Complete Self-Study Course for all Musicians’. The latter I bought because I know it is my weakness and I thought it would help me improve my music theory. Both books come with CDs. I may review the books at a later date. Once home the piano was set up on the desk in the office. (I have since purchased a keyboard stand a la Craigslist! ) Or you can buy the Casio CDP-120 stand online. The manual is fairly simple. Some of the new functions of the keyboard are for when it is connected to the computer: Keyboard Channel and Local Function. I have not used these functions as of yet so cannot comment on them. Volume control knob on the top. Demo/Function button: plays five demo songs for each type of piano and strings. Beautiful to listen to! Holding the Demo button and pressing any of the assigned black or white keys activate another function of the keyboard: Touch, Tune, Reverb, etc. Grand Piano 1: The original sound and default. Grand Piano 2: To me, it just sounds like a softer/muffled version of the Grand Piano 1. Harpischord: Whenever I hear this I think silent movies or a joke or even the Addams Family. It makes me smile, but I can’t take this sound too seriously. Strings: Beautiful sound for accompaniment. You are also able to play two sounds at the same time when you press both of the buttons of the sounds you want to hear at the same time. My favorite is Grand Piano 1 with the Strings. It is a beautiful, full sound. You can go back to single mode by just pressing one sound button. Starting from two octaves down from middle C begins the additional functions of the keyboard activated by pressing the Demo/Function button and the appropriate white or black key. Touch Response: From the low two octave C to D# activates how sensitive you want the keys to be to your playing. Tune Function: From F to F# can fine tune your keyboard to adjust to other musical instruments you may be playing with. Transpose Function: From G to G# changes the pitch in semitone steps. Range is +/-12 semitones. Default setting is 0. Reverb Function: From C to A# adds a longer duration of reverb to notes without the damper pedal. Chorus Function: From middle C to F “adds depth and breadth to notes”. It makes it sound like there are multiple instruments. OS: Windows XP (SP2 or late), Vista, 7, Mac OSx (10.39,10.4.11,10.5.8 or later, 10.6.6 or later). The XP has to be Home Edition or Professional (32-bit); Vista (32-bit); and 7 (32 or 64-bit). Keyboard Channel Function: G to G#. Sends Digital Piano date to the computer. Channels range from 1 to 16. Default channel is 1. Local Control: A to A# controls whether you want the Digital Piano to sounds notes on the keyboard when exchanging date with the computer. Middle are the Damper Pedal and DC ports. So I suppose I need to do a pros and cons list. PROS: The Casio CDP-120 is compact, light (25lbs-ish), sounds and feels like a real piano, and there is no need for tuning!…Ever! You can play as loud as you want (with headphones) and not bother your house mates or neighbors. The CDP-120 is also great for beginners, students, and intermediate players. CONS: The standard damper pedal slides around under foot…and yeah, that’s all I got for cons. To circumvent the damper pedal issue, I received the Casio SP-20 Piano Style Sustain Pedal as a gift to use as a more traditional style damper pedal. It looks and feels more like a real damper pedal from a piano than the blocky one that comes standard with the keyboard. How do I wrap this up? The Casio CDP-120 88 Weighted-Key Digital Piano (Standard) is a combination of the best of both worlds. You can have the sound and feel of a big piano that will not take up a lot of room in your apartment in a compact, portable and affordable package. It’s grand! LOL Yeah, I had to go there! Groan all you like! E Rating (1 E= meh, 5 Es = Eenae Endorsed): EEEEE. ← Taxes and the Government - What is going on in America??? Perhaps some double stick tape could solve your damper pedal sliding issues. I just bought one and love the absolutely spot-on sound of (at least) a baby grand. The thin sound of my Yamaha keyboard’s piano feature finally revealed itself as a poor substitute in recordings, so I gave up the $400 ghost and just bought a CDP-120 at Guitar Center yesterday, after having played a couple of my songs on it. Sold. Love that deep, rich, believable sound, and look forward to hearing its richness ring through as a supporting or lead instrument in those recordings. I’m actually a fretless electric bass and jazz guitar (hollowbodies mostly) player by trade, but have come to rely more and more on keyboards for composing the more complex parts of my songs. You can get a piano-style “damper” pedal for $20-$30 to replace that cheap sustain pedal from just about any music vendor. It’s worth the investment; the piano-style pedals feel better under the foot and slip around a lot less, especially the Roland models. BTW, thanks for the detailed review. If this keyboard can do the USB/MIDI trick with an iPad, I’m buying one to replace my current controller. If you find out that is works with the iPad please let us know. Thanks. I’m going to drop by GC tonight or tomorrow with my iPad and find out. Thanks for the write up! I was shopping for just this when I came across your review. I was surprised at how many 88 weighted key controllers are out there. The trick was finding one or two that aren’t workstations, big and heavy digital pianos, or soundless midi controllers for less than $650. It’s a short list and your review helped me make the decision. I found this unit on Muscian’s Friend on sale for the holidays for less than second hand units on craigslist. I’m excited to start playing piano. Couldn’t have gotten going without finding an affordable weighted keyboard to practice on. Thanks again for the detailed review. The only disadvantage for me would be the lack of 1/4 inch output jacks. The headphone jack is nice but isn’t the best for recording from. I know that’s asking a lot, but my Privia, which is the next cheapest model that has them, was more expensive and comes with a lot of unnecessary bells and whistles. I wish there were a weighted keyboard with 1/4 inch outputs and solid, no-frills sounds – if someone knows of one, please tell me! But yeah, I generally endorse the Casio line of weighted keyboards. They sound and feel way better than Yamahas IMO. I’d throw down the 25 bucks on the Roland pedal too, it’s good stuff. The USB MIDI does work with iPad (and everything else). In relation to the recording comment (and headphone jack), if you’re that worried about the sound quality via the headphone jack, why would you bother using the on-board sounds for recording anyway? MIDI this board into a decent sample bank or softsynth for recording. I played on this board a couple times at my local GC, and compared it to others available. For the price, this bad boy can’t be beat. For some odd reason, GC is selling this board for $50 more than its own sister companies, mFriend and m123. Although GC will price match, they wouldn’t also match the sale price being offered by MF last weekend, so I ended up ordering the board online rather than taking it home from the store. Saved me nearly $100 if you include the price match, the $30 MF coupon, and the sales tax I didn’t have to pay on my total order (gig bag and X stand). I just sold my Roland EP-9, so I actually came out of this deal with a net gain. Merry Christmas! Does this have two-track recording like the Williams Allegro 88-key and overture 88-key keyboards do? I’m planning on getting either the Allegro or this, and if this has the two-track recording then I’ll go with it for sure. This board does not feature on-board recording. IMHO, it plays and sounds better than the Williams models, but if that’s a feature you need, go for it. I had four-bank recording on my Roland EP-9 and rarely used it for anything other than phrase practice. I have so many other recording toys, I really don’t need that on the controller/piano. My CDP-120 got held up by the holiday, but it should be in my hands on Monday. Can’t wait! I think I’ll go with the CDP-120 since I keep hearing Casio is a better brand, and the more I think about it the more I realize I don’t really need the recording feature. It would be a tad more convenient to have it but I have slightly less convenient alternatives, and for the same price I’d rather get a better brand. Thanks guys! I’m definitely going to be checking out all the digital piano vendors at NAMM in January … Sunday floor deals, baybee! Is there a line out so I can connect this to my PA system? It has a single 1/4″ TRS (stereo) headphone/audio output. Yes. In fact, I’m going to plug that model into a PA later today. Just bought this piano for $300 CDN (it was on sale @London Drugs) Very impressed with it. I was wondering how I would record things into my computer? Sorry, I’m new at this; I had an upright before. For recording you could do it one of two ways. First you will need some sort of digital recording software also known as a DAW, (Ableton Live, Pro Tools, Sonar, ect.) then you can either record the midi information through your USB cable into the DAW and assign your final piano sound there through piano samples included with the software, or, you can take the audio output with a stereo quarter inch cable and record the actual audio of the casio into the DAW. There might be some free simple DAW software programs out there that are not too complicated, and I think Pro tools might have a lite version. Personally I am a fan of Ableton Live, and was previously a long term user of Sonar. I also received this digital piano a few weeks ago and overall I think it is pretty good. We paired it with the CS44P keyboard stand which makes it almost into a Piano. I use 100% macs and connecting a USB cable from the Piano to the Mac turning the Local sound On/Off is a breeze with Garageband and Main stage. However, I can’t for the life of me figure out how to send the computer sound back into the Piano speakers. In the past and on other keyboards this is generally accomplished by taking a 3.5mm cable from the headphone/digital port of my Macbook Air to the Piano with a 1/4 keyboard plug to fit into the Piano. For whatever reason, I can only hear sound into the Piano speakers if I push it in half way or attaching a separate speaker to the mac. For whatever reason it seems to disable the output port of the Piano. Pete: You are correct in that it isn’t possible to do that with this keyboard. hi guys, i wanna but a digital piano, which i can practise piano, and use via softwares like cubase to record/arrange songs. i was thinking of getting a williams allegro 88-key, but as far as i could understand, it doesn’t have an usb interface, but it’s cheaper. which one do you recommend? thanks for the review and further help. I just got the CDP120 too. While it is decent as a digital piano by itself, it is much more when connected to a computer and the right software and good speakers. When connected to Synthogy Ivory, Steinway, man does it sound and truly feel like a real and large grand piano! 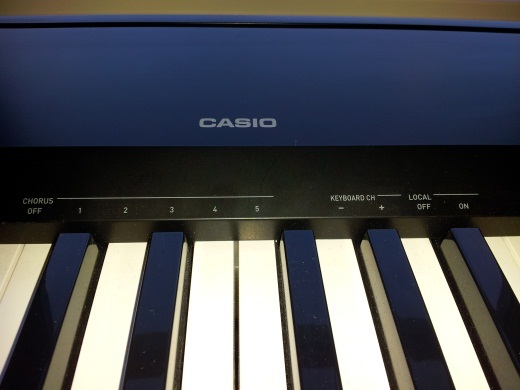 The combination of the Casio’s action and software and speakers sound – the notes ring out and sustain the way they should. After playing that a while the Casio’s own sound with its little speakers really starts to feel puny and sick and lacking the sound nuances Ivory has. And with the right digital audio workstation software, like Mixcraft, and VSTs (virtual studio technology instruments, many of which are free on the net) well, basically, you have the entire realm of all things music at your fingertips. You can throw together tracks, add vocals. I guess I’m getting off topic, but, getting this keyboard prompted me to become aware of what it can enable a computer to do. Chris, Thank you for that comment! I have not hooked it up to a computer so did not have the experience to say anything myself. This will be helpful to others who are looking to purchase this wonderful keyboard! Thanks and happy holidays! I’m confused. What kind of output connection is on the cdp-120? Is it a 1/8 inch or 1/4 inch? I just bought this piano and I feel the speakers are really puny, so much so that i think maybe my one has a problem. With the volume all the way up it’s still just about normal, not at all loud in any way. I tried out the yamaha p35 which supposedly has a lower output but it is way louder. Any ideas? I haven’t found the internal speakers to be too quiet, however, I hardly ever use them. I primarily use my CDP-120 as a MIDI controller and stage piano (plugged into an amp or PA). Most digital pianos have less-than-amazing on-board sound; plug that baby into your amp, PA, home stereo, or surround-sound receiver! I have an old casio keyboard that is not being recognized by learn to play computer software. Have a midi to USB cable. Thinking it might be too old. Thinking of buying the 120 to learn how to play. For the midi to work on windows 7 do I need to download drivers or can I just use any USB cord to the computer and it will recognize the keyboard.. New to all of this. Im looking to buy a keyboard solely to use learn to play computer software that is simple to use with windows 7.